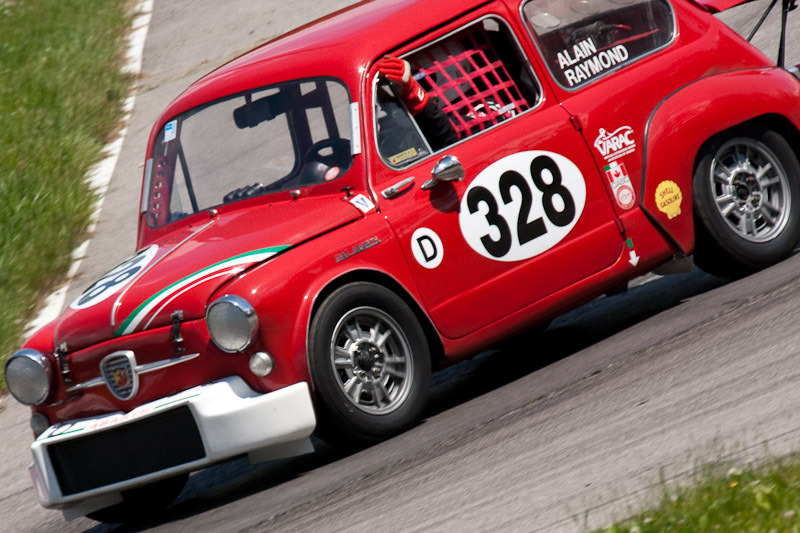 Alain Raymond always dreamed of owning a Fiat Abarth. He had owned its lowly cousin, a Fiat 600, while he was a student in Lebanon. “It was a basket case. But anyway, it was my car,” he recalls. Many years later, Raymond, an auto writer for La Presse, a French-language newspaper in Quebec, realized his Italian dream in Denver: a former racer driven by Umberto Toscano. “You can’t get any more Italian than that,” Raymond says. While it looked forlorn at first sight, its new owner was not disappointed. “I promised myself that one day, I would get a real one, an Abarth. And that’s what I did. Voilà!” he says. Just the name, Abarth, gives car enthusiasts the warm fuzzies, at least the older enthusiasts. Carlo Abarth was considered a master at converting an ordinary production car into a raging “bomba.” Although he probably is best known for his Fiat conversions, he also was involved with Ferrari, Lancia and Porsche. The Fiat Abarth is based on a Fiat 600, like the one Raymond owned years ago, which was considered the “people’s car” in Italy. It was powered by a watercooled, four-cylinder, 600-cc engine that produced 28 hp. However, Abarth gradually modified the car, which appeared in different iterations: the 750 TC, the 850 TC and the 1000 TC. The Abarth’s characteristic open rear deck was designed to help with engine cooling, but it also enabled the car to reach higher top speeds. The car’s tendency to lift its inside front wheel in turns was another characteristic. Since purchasing his Fiat Abarth 1000 TC, No. 328, Raymond has been competing with it in historic events throughout the United States and Canada. He owned a Mazda Miata, which he autocrossed before buying the Abarth. And he has no regrets about selling one and buying the other, even though the Fiat requires tons of time for maintenance. it stop and corner, including disc brakes and adjust-able shocks. “I normally shift at 7,500 or 8,000,” he says. But in the final installment of the 2008 Pittsburgh Vintage Grand Prix, Raymond confessed that he was shifting at about 6,000 rpm through the makeshift track carved from within Pittsburgh’s Schenley Park--just to be on the safe side. After modifying Fiat's 500/600 line for nearly a decade, Abarth became one of the most sought after and ambitious Fiat tuners. Made in partial agreement with Fiat, these 1000 Berlina Corsa's represented the last and most potent evolution of these models. As such, the 1000 benefited from all the versions which came before. SO much so, the 1000 raced successfully up to 1970. The first 1000 Berlinas appeared in 1962 and used a version of the Fiat 600D engine. Prepared for road and track, these cars helped win points in the 1000cc Touring Car Class. Limited to only 68 bhp, and only finishing 32nd at the Rally Monte Carlo, the racing version was replaced by the Berlina Corsa in 1964. The Berlina Corsa was distinguished by its front mounted radiator that was placed upfront and in between the bumper bars. Its engine was tuned to produce 76 bhp helped the car reach 185 kph. Cooling was aided by permanetly opening the engine hood. In 1965, the model was updated with a larger radiator and support shroud which eliminated the need for a fan to cool the rear unit. The window wipers also used a new linkage and a fuel filler cap was located in the center of the front hood. These verions helped dominate the 1965 Division 1 Championship for 1000cc and smaller cars. They also secured similarly structured Italian Championship sub-classes. Abarth continued on with this model in 1966 with a larger front radiator shroud that extended the entire width of the car. This was good to win the Division 1 Touring Car Championship and the similar Italian Championship. The cars also competed in many Hillclimbs and Rallies with intermittent success. Many of the factory works cars in 1966 were painted with red checkerboard roofs. Beyond 1967, the cars continued to race much in the same vein as they did in previous years, dominating the 1000cc class of the Italian Championship and the International Touring Car Championship. In 1970, they were updated with huge rear flares for Group 2 racing following the Appendix J International Regulations.